Determining the Heart Axis is one of the most difficult steps on an Electrocardiogram analysis, but we hope that it will become a much easier task for you, after reading this page. 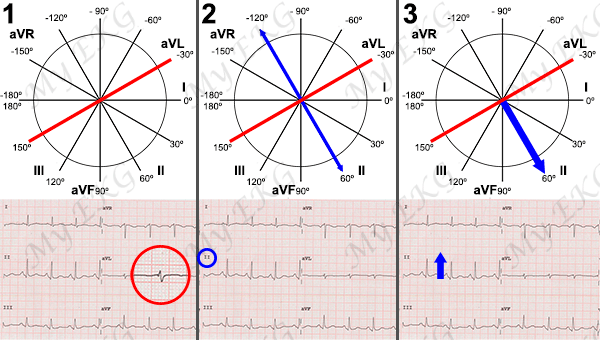 By concept, the Cardiac Axis, or let’s call it by its proper name, the QRS Axis, is nothing else but the direction of the total vector of the ventriclular depolarization. This may seem like it’s written in an alien language. To make it more more understandable, we can say the Cardiac Axis is the main direction of the electrical stimulus through the ventricles (I hope that’s simpler). If you do not want to rack your brains, in this website we can provide you with a Heart Axis Calculator. You just have to enter the amplitude ot the QRS of two leads to obtain the actual value of the Cardiac Axis. Between -30º and 90º: Normal heart axis. Between -30º and -90º: Left axis deviation. Between 90º and 180º: Right axis deviation. Between -90º and -180º: Extreme axis deviation. Before calculating the Cardiac Axis, we must understand that each lead represents a different point of view of the same electrical stimulus. To calculate the cardiac axis we will only use the limbs leads. Taking the Example of the Bus, the Limbs Leads are 6 windows that look to the heart in the frontal plane, that is: from above, below, left and right. Never from the front or back side. Each of the leads “observes” the electrical stimuli in a different way. When the stimuli moves away it yields a negative deflection, positive if it approaches the lead. If it is perpendicular to the lead, it is biphasic. After this theoretical introduction, we can proceed to the Heart Axis calculation. It will allow us to know in which quadrant is the electrical axis by looking at two leads. How? Very simple. We check whether the QRS deflection in leads I and aVF are positive or negative. With this we will be able to determine if the Heart Axis is normal or a deviation is present. 1. If the QRS in leads I and aVF are positives: Normal axis. 2. If the QRS are negative in both leads: Extreme axis deviation. 3. If the QRS is negative in lead I and positive in lead aVF: Right axis deviation. 4a. If the QRS is positive in lead II: Normal axis. 4b. If the QRS is negative in lead II: Right axis deviation. We must locate an biphasic lead, then we look for the lead perpendicular to this one. 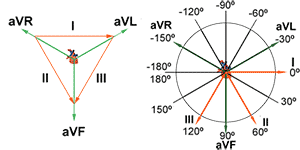 Example: If aVL is biphasic, we look for the lead perpendicular to it, that is, II. 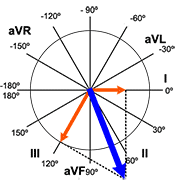 As the QRS complex is positive in lead II the axis is in the same direction, 60º. 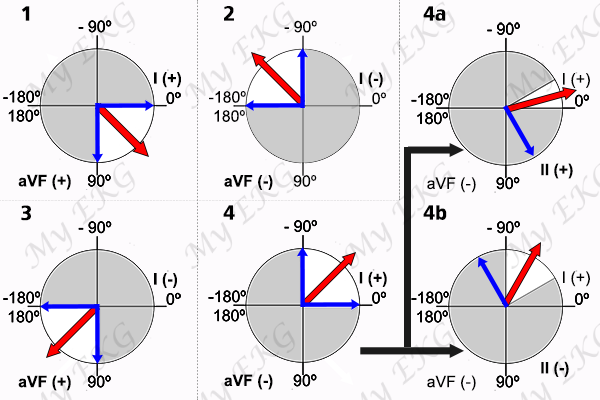 If you want to know the exact location of the Cardiac Axis (for example: "The Axis is located at exactly 63º"), you should measure the QRS in I and III, translate the measurements to the Hexaxial Reference System and manually calculate the Cardiac Axis angle. So to make it possible for you to say the axis is 38º or 21º, we provide you with an Axis Calculator, so you only have to fill the QRS in leads I and aVF to get the exact value. We hope we have been able to help you. For further details on ST Segment, Abnormalities, click Next.